Saturday, June 27, 2009 — Beginning at 3 p.m. Double your derby! Double your fun! L.A. Derby Dolls host TWO bouts in ONE day of all-girl banked track roller derby action! 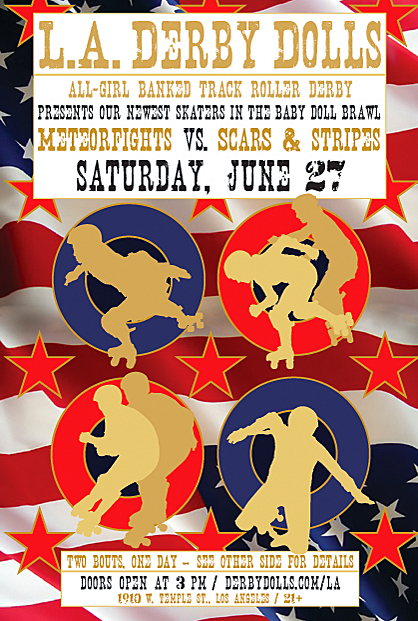 The day explodes at 3 p.m. with an exciting exhibition of LADDs newest skaters, known as the Baby Doll Brawl, featuring the latest, greatest rookie skaters. Baby Doll Brawls are known for two things: being an all-ages bout (so you can bring the whole family including the kids), and featuring some of the most spectacular, cringe-inducing hits and spills. The rookies are hungry to prove themselves as future Derby Doll stars and they play it like they mean it. Expect this patriotic crop of baby dolls to bleed red, white and blue when the Scars and Stripes faces off against the Meteorfights. Derby fans ages one to 99 can’t wait to check out this rare ALL AGES bout! At halftime, the L.A. Junior Derby Dolls, the first and only banked track junior derby league for girls ages 8-17 in Southern California, will scrimmage and show you how cool you could have been when you were a kid. This is the only opportunity to attend an ALL AGES bout. Adults should fear not as a full beer garden will be flowing to ensure a good time is had by all. Doors open at 3pm. Bout starts promptly afterward. Children under 10 free for general admission, $5 for VIP. 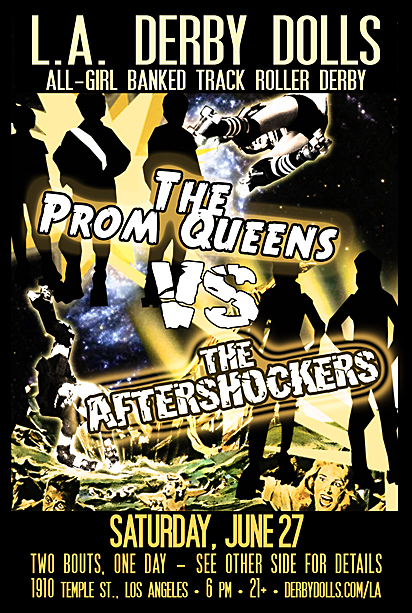 After you’ve gotten your appetite wet with some rookie violence, stay to witness The Aftershockers, LADD’s All Star B-Bracket Team, shake up the track against The Prom Queens, a random mix of SoCal flat track skaters who live for tiaras and roller derby. This event is 21+ and doors open at 6:30 p.m.
Purchase the package tickets for BOTH events at a superbly discounted rate! Tickets for each event are also available separately. ABSOLUTELY NO CAMERAS ALLOWED! BRING YOUR ID IF YOU ARE 21+. DOOR OPENS AT 3 P.M. AND BOUT STARTS PROMPTLY AFTER. DON’T MISS A SINGLE MINUTE AND COME ON TIME. Get your general admission ticket NOW ONLINE as the price is MORE at the door – plus, you know we sell out and you know what that means! We may not have tickets for sale at the door! Parking is available for $8 at Silver Lake Medical Center, 1711 West Temple (near the intersection of Temple and Union), one block east of the Doll Factory. NO NEIGHBORHOOD PARKING IS ALLOWED. CHECK THE HOTLINE 310-285-3766 the day of for game information.